Fernando Alonso Díaz, or El Nano, is a Spanish Formula One racing driver who has a net worth of $100 million. It is known that Alonso’s annual salary reaches $40 million, as the racer has twice been a World Champion and today he is racing for the Scuderia Ferrari team in Formula 1. He also has also driven for McLaren, Minardi and Renault and competed in all Grand Prix’s around the world. During his career Alonso has even once appeared on TV in a film called “The Official Review of the 2007 FIA Formula One Championship”. Of course, driving for such a team as Scuderia Ferrari has added a huge pot of money to Fernando Alonso’s net worth. 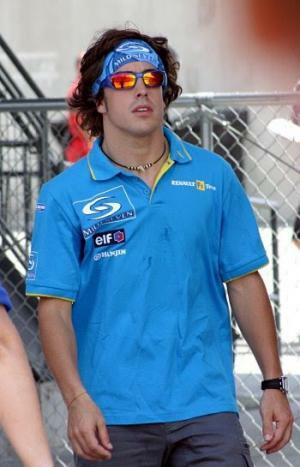 Fernando Alonso Diaz was born on 29 July, 1981, in Oviedo, Asturias, Spain. His fathers was a keen amateur kart racer, and he expected that son would take-up his passion. When he built a kart for Fernando’s older sister Lorena, she didn’t show any interest in this sport, but young Fernando did. With the support of his father Fernando participated in different carting competitions in Spain. In his early career Alonso won 4 Spanish championships in the junior category and later he became a winner of the Junior World Cup in 1996. Even if this victory didin’t bring a huge amount of money to increase Alonso net worth, it was an big encouragement to continue this career. Two years later Alonso finished second in the European Championship. Farnando Alonso started his Formula One career in 2001. He was one of the youngest drivers ever at the beginning, when he made his debut with Minardi during F-1 motor race held on 4 March 2001 at the Melbourne Grand Prix Circuit (Australian Grand Prix 2001). Today after more than 10 years of successful driving and competitions, Alonso has not only been able to build up his net worth, but also to finish first, second or third in the F1 Championship while driving for Scuderia Ferrari team. Winning in such competitions as Formula One was definitely the main way to increase Fernando Alonso’s net worth. In November 2006 Alonso married a popular Spanish singer, Raquel del Rosario Macias – leader of the band El Sueño de Morfeo. But this marriage didn’t last for long, and the couple divorced after five years of living together, in December 2011. Fernando Alonso also serves as a Goodwill Ambassador for UNICEF (The United Nations Children’s Fund), which provides long-term humanitarian help to children and their mothers in developing countries. El Nano owns four cars in 2014 – Maserati Gran Calibrio, Ferrari 458, Megane Coupe and Renaultsport Clio 197. It looks like he doesn’t plan to stop – Alonso is still A young and VERY promising man who is definitely going to participate in many more competitions in the future, so his net worth is going to rise even more.